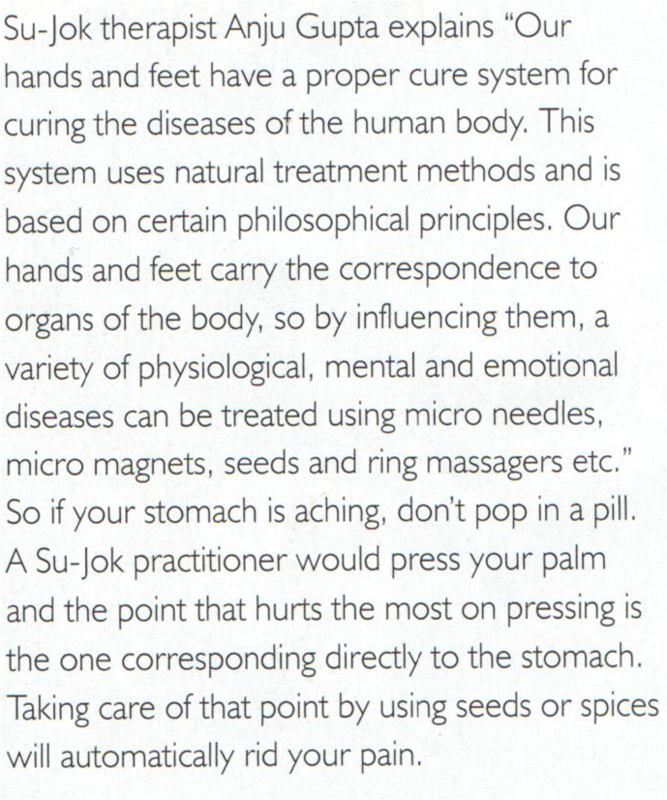 Sujok can treat a wide range of ailments including chronic ones. They include disorders of body, mind, emotions, conception or psychiatric problems. The problems can show up in any part, organ or system of the body: head, spine, ear, nose, throat, eyes, nervous system, glands including thyroid, cardiovascular system, etc. Overall, what is being treated is not the ailment, but the imbalance that is causing the ailment in the person. So for instance, two women who are not being able to conceive, may have some conditions in common, and others which are unique to them. Each patient is unique, and each ailment is unique. That is where the skill, experience and consciousness of the Sujok therapist comes in. At each stage, however, the patient is involved in his or her own healing. Some conditions can be treated at one sitting; and others need to be treated over a longer time, using a protocol that is worked out. Anyone with ailments qualified as “untreatable”, “requiring lifelong treatment” or whose treatment lies in suppression of symptoms, can contact for evaluation via alternative therapies, using mainly ancient Indian systems, rejuvenated. “I take up only those cases which have been diagnosed by modern hospitals as “untreatable” or “require lifelong medication”. Advice: There is no known conflict when this system of treatment is carried out simultaneously with any form of medication – Allopathic, Ayurvedic, Homeopathy, Unani, Siddha or any other. Patients are advised to continue their medication and make any changes only with the specific advice of their Doctor in that field of medication. any solution to grow hair on bald head?? Any hope for curing R.L.S (restless leg syndrome) ? I’m doing SuJok practice, but need some detailed and advance studies as well certification, as being distanced learner, I need some online solution for started.